WILLEMSTAD - Logos Hope will soon arrive in Willemstad, Curaçao and be opened to the public at Prins Hendrik Wèrf, Sta Annabaai Otrobanda, from February 4th through March 11th, 2017. This unique vessel with international crewmembers offers exclusive onboard events for people of all ages, in addition to its array of quality, affordable books. Don’t miss out on the opportunity to meet the crew in the book fair and the events on the ship! Guests can experience unique cultures and hear stories from people representing many nations around the world. They can look forward to a time of friendship and community, and also enjoy an interactive cultural programme. All events have limited seating. Tickets are available onboard the Logos Hope. Visit www.logoshope.org/curacao for more information. Logos Hope offers an expanded selection of over 5,000 titles at affordable prices. The rest of the Visitor Experience deck is also open for the public to explore. From the Welcome Area, which introduces the new vessel through a short movie and interactive displays, to the International Café, which has ice cream, drinks and snacks for sale, there is sure to be something for everyone. 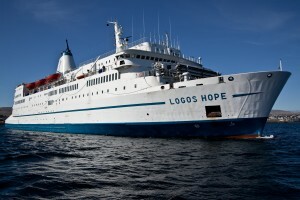 Logos Hope is operated by GBA Ships e.V., an international, charitable organization registered in Germany. Since 1970, the organization has welcomed over 45 million visitors up the gangways in over 150 countries and territories around the world. MV Logos Hope will open to the public at Prins Hendrik Wèrf, Sta Annabaai Otrobanda from February 24th through March 11th, 2017. Opening hours are as follows: 10:00am - 9:00pm (except for 24th Feb and 5th Mar. : 2:00pm - 9:00pm and 4th Mar. : 10:00am - 4:30pm). The ship is closed: 26th Feb, 28th Feb. and 6th Mar. Entrance fee is 1 Fl per person. Adults 65 and over enter for free. Children under 12 years old enter for free, but must be accompanied by an adult.